The Creative Sewing Machines' Workbook for V5 is no longer available in printed form. The workbook is available as a digital download. We ask that you honor the copyright on the material and do not print more than one copy of the book. It is unlawful to distribute this workbook electronically in any form. Lesson 2 - BERNINA artista Editor Plus or artista Designer Plus? Lesson 4 - How do I get a design on the screen? Lesson 19 - Fancy That! Lesson 34 - Colors aplenty! Lesson 37 - Don’t forget Portfolio! 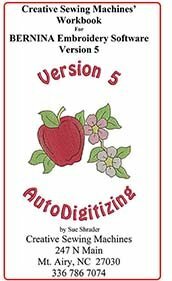 Lesson 45 - Block Digitizing or Closed Object digitizing: Which will it be? Lesson 55 - Extra Project "Grandmother’s Gift"